Transparency Market Research (TMR) has released a market study that analyzes the development of the global bitumen market from 2014 to 2020. According to the report analysis, this market will expand at a CAGR of 3.90% from 2014 to 2020 to reach a valuation of US$93.4 bn by 2020, which was valued at US$71.4 bn in 2013. The production volume of bitumen in 2013 amounted to 108,348.8 kilotons.The report, titled “Global Bitumen Market - Industry Analysis, Size, Share, Growth, Trends and Forecast, 2014 - 2020”, is available for sale on the company website. Infrastructural development across the world, of which road development activities constitute an important element, is a major factor fueling the global bitumen market, says the report. However, environmental deterioration associated with the extraction of bitumen is restricting the development of this market to a large extent. The availability of alternative materials that are at par with bitumen for both cost and performance is also hampering the growth of the bitumen market. The report divides the global market for bitumen on the basis of product, application, and region. Types of bitumen such as paving grade, cutback, polymer modified, oxidized, emulsion, and others (including bitumen produced due to the addition of copper, zinc, etc.) are the product segments of the market. Of these, it is the paving grade product segment that emerged as the clear leader in 2013. However, as per analysts’ predictions, polymer modified bitumen will be the fastest growing product segment over the forecast period due to its utilization for road construction. Polymer modified bitumen exhibits properties of high skid resistance, high porosity, and low noise, all of which are favorable for roads to offer higher safety against accidents. Over the past few years, the utilization of polymer modified bitumen has increased fourfold in roofing applications, the high resistance of the material to water being the reason for this. Thus, the application range of bitumen has widened, boosting the global bitumen market. 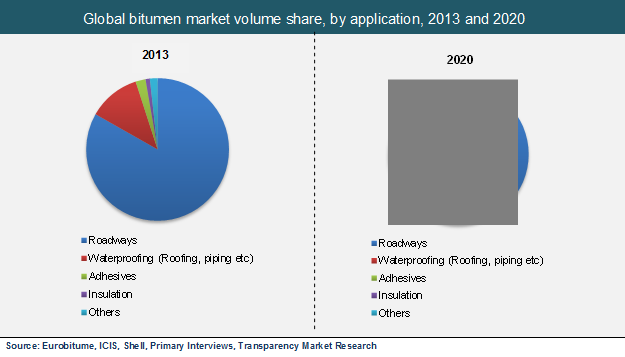 The application segments of the bitumen market are roadways, waterproofing, insulation, adhesive, and others (including industrial and decorative applications). With a share of more than 80% in the total market, roadways were the clear leader in 2013. However, it is the waterproofing application segment that is expected to register the fastest growth during the forecast period. The regional segments of the global bitumen market are North America, China, Rest of World (RoW), Europe, and Asia Pacific (excluding China). North America was the largest consumer of bitumen in 2013 owing to the extensive road networks in the U.S. More than 30% of the bitumen produced globally was consumed by North America. However, Asia Pacific will emerge as a leading market for bitumen during the forecast period due to rapid infrastructural development in the emerging economies of the region, say analysts.Some major companies operating in the global bitumen market are British Petroleum, ChevronTexaco Corp., China Petroleum and Chemical Corp., JX Nippon Oil & Energy Corp., NuStar Energy, and Indian Oil Corp. among others.